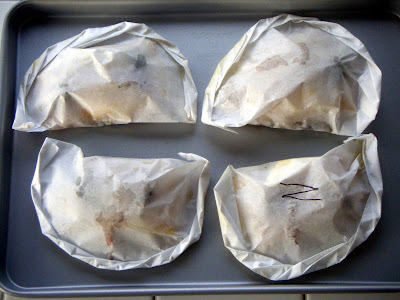 Baking fish “en papillote” — So easy, and elegant! Am I crazy, or is that “witch” Ruth Buzzi? 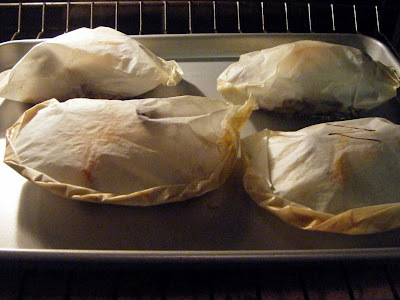 Prepared in advance, that salmon en papillote is the perfect dish for company (so long as they’re not on a diet). Why? Well, besides its glamorousity-quotient, the host or hostess can sip a glass of wine, chat with friends and nibble cocktail peanuts while dinner’s cooking — which is one of the reasons I “stole” the recipe from my friend Jack Amon, the Marx Bros. Cafe’s chef-proprietor, and have long since adopted it as my own. For years, I’d prepare my parchment-steamed fish with Jack’s Frenchified sauce (see his recipe for a crowd, below), but these days, I do my own thing. I almost always add shellfish (a shrimp or scallop, a couple of clams or mussels). 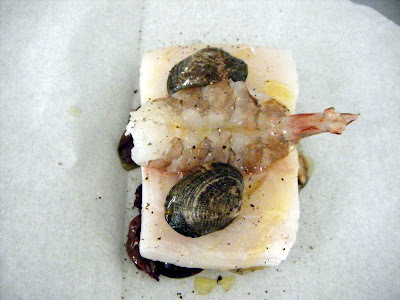 Sometimes I’ll pair the fish with Asian ingredients (maybe ginger, shiitakes, a hit of soy or Chinese black bean sauce). I frequently look toward the Mediterranean for inspiration (tomato, olives, capers, a splash of good olive oil). You can make things really simple and use a big dollop of Trader Joe’s spicy tomato chutney (which I adore), or your favorite salsa. Dieting? Lay the fish over julienned vegetables (carrots, fennel, leeks, whatever) or simply add some fresh herbs, a shot of dry white wine and a sprinkling of salt and pepper. 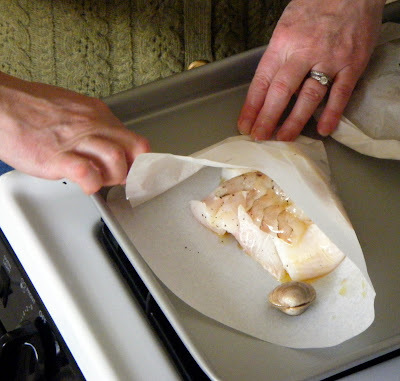 You don’t even have to have parchment paper on hand to make fish en papillote: aluminum foil works too. 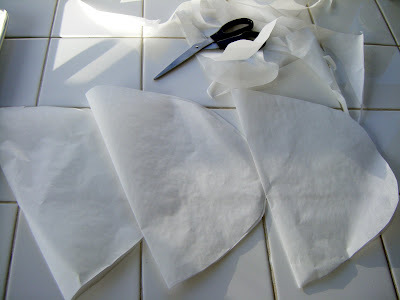 But trust me, the parchment makes a better visual impression. Plus, I’m convinced it steams the fish more gently than foil. Be sure to slice into the parchment tableside, as we did at the Marx Bros. A central snip with a pair of scissors allows the steaming perfume to do its aromatic thing, impressing your guests and making them think you’ve been slaving away all day. The length of time will vary depending on the thickness of the fish, and I’ve seen “rules of thumb” ranging from 6-8 minutes to 10 minutes per inch of fish. I find that for salmon and halibut, about 15 minutes does the trick. 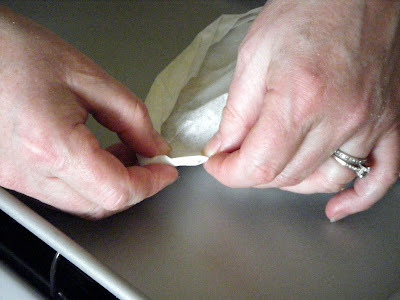 When the parchment starts to brown and gets puffy, you’re good to go. 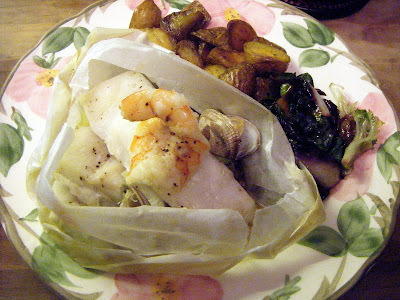 Here’s my pal Jack’s “salmon en papillote” sauce, as promised (calories? what calories?). It’s enough to serve 10, though the recipe may be halved. 1) Melt the butter in a double boiler. 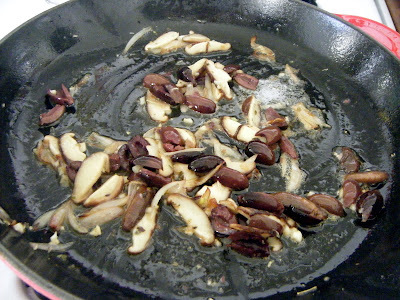 2) Add scallions and cook until tender. 3) Whisk in flour, then wine, cream and half-and-half. Cook until thickened, keeping the water in the double boiler at a gentle simmer. 4) Turn off the heat. Whisk in egg yolks and keep the sauce warm until it thickens. 5) Add parsley, cayenne, salt and pepper. 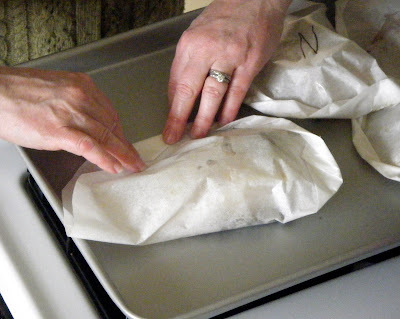 Anybody else a fan of cooking in parchment? Feel free to chime in. And have a nice weekend. It’s “movie night” at my house. Maybe we’ll make some Jiffy Pop!